Home » bad ideas , independence day , movies , science fiction , will smith » Two INDEPENDENCE DAY sequels?! Awwww hell nawwww!!! Two INDEPENDENCE DAY sequels?! Awwww hell nawwww!!! 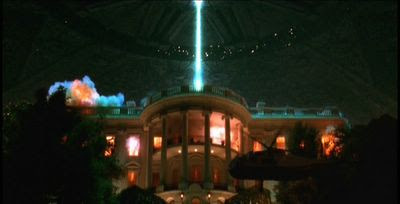 IESB.net is reporting that Twentieth Century Fox is about to commit to two sequels to Independence Day: its 1996 mega-blockbuster about aliens arriving on Earth to wipe out humanity on the Fourth of July. Will Smith is already set to return as Steven Hiller, the hotshot pilot he played in the original. Do we really need this? For its tenth anniversary in 2006 I posted an extensive write-up about Independence Day. As much as I still love the movie, too much time has gone by since the original. It remains a product of its era and to make sequels to it would make a mockery of that. Well, I think so anyway. I do think that Independence Day could be rebooted (since that's the route every other movie franchise seems to be going these days). I mean, think about it: who in America wouldn't want to see the White House and Congress blown up once more? I saw Independence Day seven time in the theaters that summer. Having alien invaders make a smoldering crater out of Washington D.C. all over again would have me coming back at least TWICE as many times just to see that! But...wasn't the premise of the first one that it was all destroyed already? I tend to agree with you - some sequels are best left undone. The fact that it was a horribly bad movie is also another reason. I loved it when I was a kid. It's cancer inducing on the eyes now. I can remember sitting in a now-non-existent movie theater in Greensboro with Chris on opening weekend with literally standing-room only availability to watch ID4. As I recall, Chris even built a website about the movie and got an email from either Roland Emerich or Dean Devlin about how they liked it.